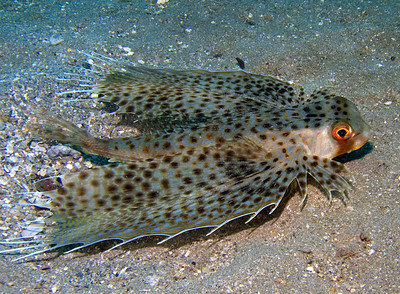 A flying gurnard (Dactyloptena orientalis)in partial display. 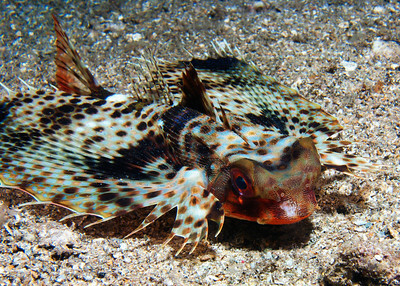 These amazing fish can spread those wing-like pectoral fins wide to frighten predators. 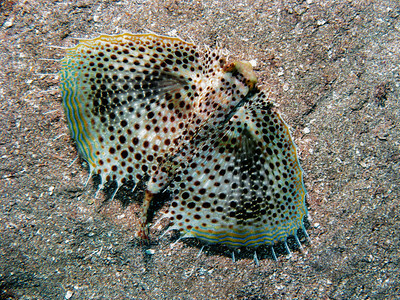 They're also interesting in that they usually walk on odd, leg-like projections of their fins rather than swim. 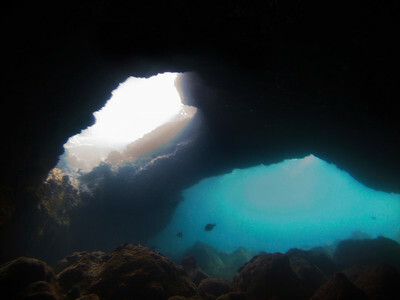 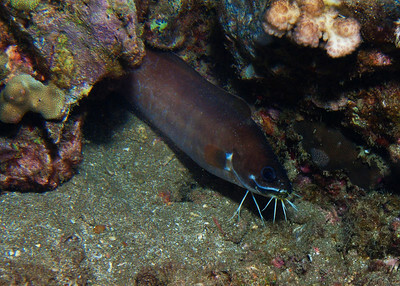 It's a rare treat to see one of these on a dive in Maui. 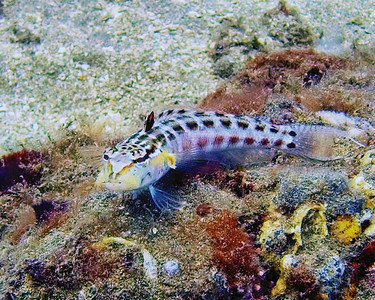 I see this fish often, but this is the first photograph I've managed to get: a Fowler's pearlfish (Onuxodon fowleri) which hides in pearl oysters and other bivalves during the day, coming out to forage at night. 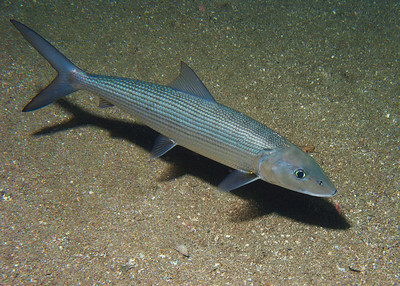 And from the tiny to the large...a beautiful study in silver-blue, I had a nice visit with this fantastic Shortjaw bonefish (Albula glossodonta). 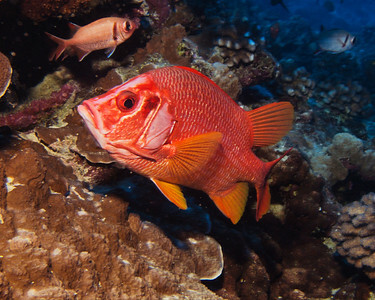 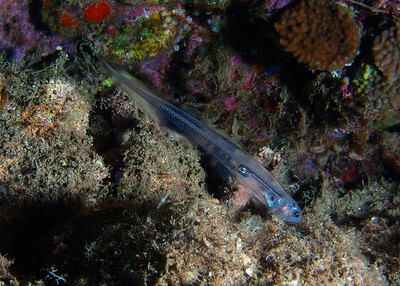 These extremely shy fish flee quickly during the day, but at night sometimes can be cautuously approached. 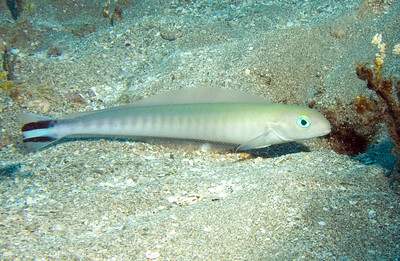 Bonefish have become rather rare in Hawaii due to overfishing. 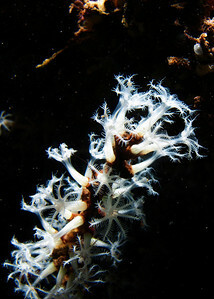 This is a rare sight--a black coral tree in shallow water. 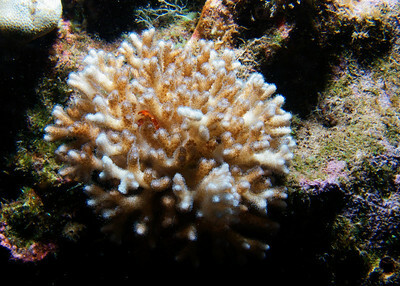 This unusual coral typically grows very deep as it doesn't tolerate sunlight very well--but this one happened to get a foothold under a dark ledge in 10' of water! 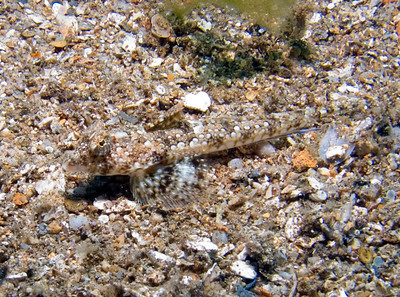 This fish isn't so much rare as invisible...a very well camouflaged Longtail dragonette (Callionymus decoratus). 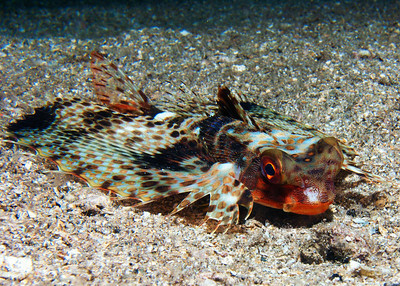 I was lucky to catch this one on the move, as they're almost impossible to see, especially when they partially bury themeselves in the sand. 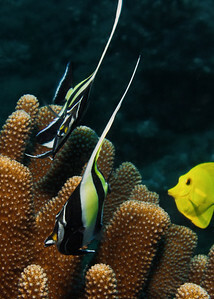 A pair of juvinile indigo dartfish (Ptereleotris heteroptera). 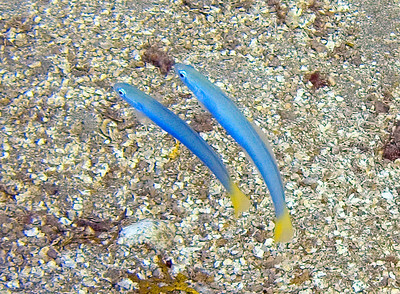 As these move into their adult phase, the yellow tail will fade into blue and develop a typical dark spot. 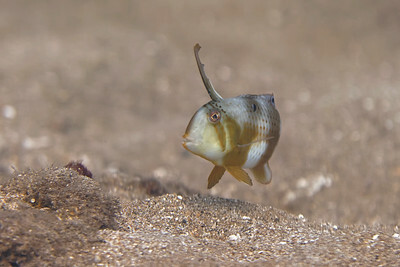 Thanks to John Hoover at www.hawaiisfishes.com for ID advice! 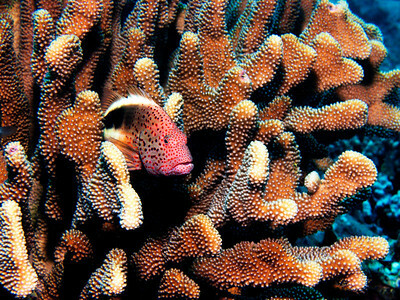 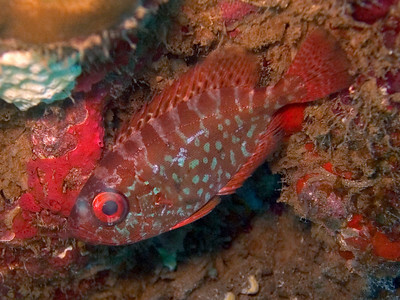 A Blackside hawkfish (Paracirrhites forsteri) on its antler coral perch. 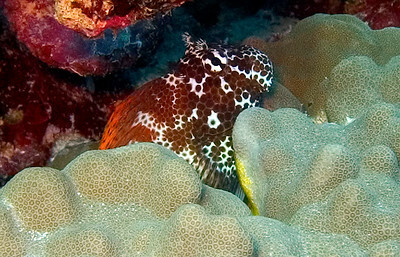 Hawkfish have no swim bladders, so prefer to sit atop coral or other perches so as to stay off the bottom without expending effort. 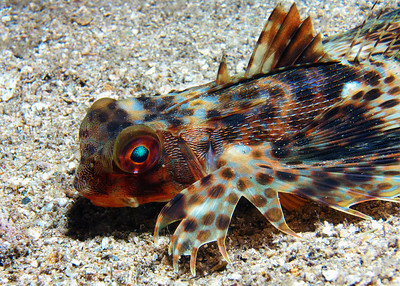 Another look at the amazing coloration of D. orientalis...from this angle you can also see the reflective surface of the retina. 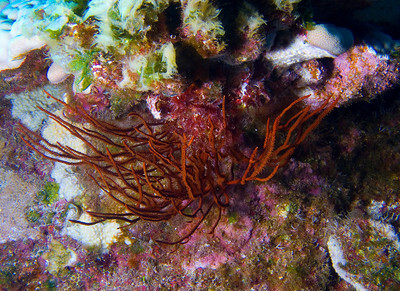 A beautiful Lace coral (Pocillopora damicornis)...you can also just see the claw of a Common guard crab (Trapezia intermedia) center-left.